Bursting with personality, 'Robo Lamp' invokes early space travel and adventures into other galaxies. 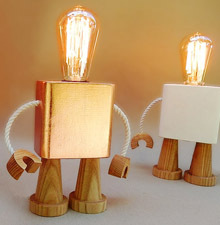 Its chunky geometry and retro filament bulb give 'Robo Lamp' definite space chic appeal. Visit us at stand 16 'ADDITIONS' to see our latest collections and new product launches! Clerkenwell Design Week 'Additions', dedicated to small design pieces and interior accessories. The show will take place at the Crypt on the Green, St. James Church. Open from 10am-9pm every day during CDW. As part of the London Design Festival join us at West Elm on Tottenham Court Road in London, on the 16th September from 6pm - 10pm to celebrate the launch with our initial makers; HAM, Matt Pugh design, Mini Moderns, James Ward - Jimbobart + Out Of The Dark. 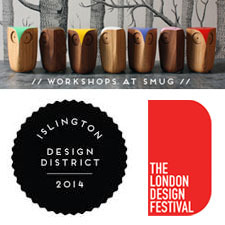 Join us at SMUG in Islington, London, and decorate your own Matt Pugh Owl on Sunday 14th September from 2pm to 4pm. We are exhibiting at Maison & Objet. We are exhibiting and selling at Grand Designs Live. Find us in the Design Arcade. 4th - 12th May 2013. Matt's Owls, spotted by a friend, on the set of ITV's 'This Morning' show. Exhibited at Maison & Objet, Paris. Exhibited at 100% Futures, part of 100% Design, London. Exhibited at Tendence, Frankfurt, Germany. Exhibited at International Contemporary Furniture Fair, New York. Exhibited at 100% Design, London.